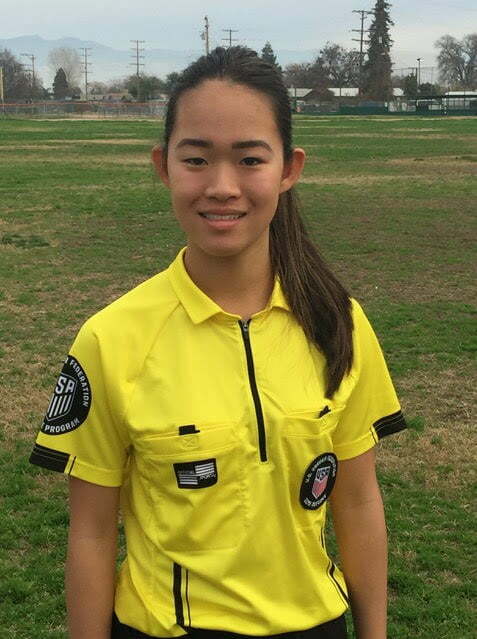 Editor’s note: Lynlee Davis was recently named CYSA District 7 Youth Referee of the Year for 2017. These are some valuable insights she had to share. I became a referee for Robert to learn the rules of the game and further my knowledge in the sport of soccer. Once I got into it, I realized how much more the job was and that I had a lot of fun refereeing games. I enjoy monitoring the youth soccer games as the referee, mostly because it’s fun to see how a player progresses in their skill and knowledge on the game. Without a referee, the game of soccer can be dirty, and I enjoy keeping the youth games clean and fun for the players. I dislike the snide comments both coaches and parents make on the sidelines, even though I don’t show anything. I believe that one should be experienced in the job before they can start commenting on how a referee does during the games. Though the beginning referees may just be starting out, don’t just believe they don’t know what they’re doing. It’s good to give them tips, because they’ll soon become experienced like you. Take advice!!! Especially if an experienced referee gives the advice to you. You can only grow as a referee and gain more knowledge. As a friend once said, “You coach your team and I’ll ref my game.” The referee is on the field and can see the game better than one standing on the sideline with biased opinions. It’s good that you’re passionate about the game of soccer, but I am passionate about the games I ref and I call what I see so everyone plays according to the rules. Until you are a licensed referee, please do not try to yell at any of the referees to sway their decisions. They know the game better because they’ve gone through courses to obtain the license. If I had a magic-wand I would like the referees to be given much more respect by others involved with the game. People, especially the parents of the players and coaches, believe they know the game better than the referees do and don’t respect them the way the referees should be respected. With the magic-wand, I would like to open the people’s eyes so they could respect the referee and the job the referee holds.